Music – “Quel Fromage #1” from Club De Paris – Traditional French Cafe Music by Café Chill Lounge Club. I am an inveterate fan of cooking shows and have been as long as I can remember there were cooking shows on TV. My mom and I first caught an episode of “The French Chef”, with Julia Child, sometime in the early 1960’s as I recall. We got such a hoot out of her holding a chicken by the leg and dangling it in the air, slamming pots and pans around and whipping up incredible meals in record time. Add to that her stature, her husky voice and stage ‘presence’, and the occasional slug of wine directly from the bottle, we were intrigued enough to watch many more episodes. I may not have absorbed a lot about French cooking from Julia, but she sure was entertaining! So many cooking shows have surfaced since Julia took the stage and today, with the proliferation of shows on the Food Network alone, you could spend your entire life watching chefs cook, compete, win or lose, do impossible tasks such as creating a wedding dinner for 200 with 7 hours (with no kitchen and no ingredients), wreck and revamp an entire restaurant in 24 hours, and create a ten course meal in 60 minutes for a panel of picky judges. You can follow chefs around the world in their quest to find and eat the most bizarre foods or witness the humiliation of the chef who prepared the worst dish of the night on “Hell’s Kitchen”, in which Gordon Ramsay seems to enjoy trashing, embarrassing and verbally abusing the chef wanna-be’s. ‘Celebrity Chefs’ have become increasingly popular and their names are well known to anyone who likes to cook. Most not only have their own TV shows, but have produced multiple cookbooks as well. Who hasn’t heard of Gordon Ramsay, Giada de Laurentiis, Alton Brown, Robert Irvine or Jamie Oliver? And then there are the show names: “Dinner: Impossible”, “Giada at Home”, “Barefoot Contessa”, “Guy’s Big Bite”, “Iron Chef”, “Throwdown! With Bobby Flay”. The list is extensive and every season new cooking shows clog the networks. What I did not know, until very recently, that the first real ‘TV’ chef was a Frenchman, Xavier Marcel Boulestin. 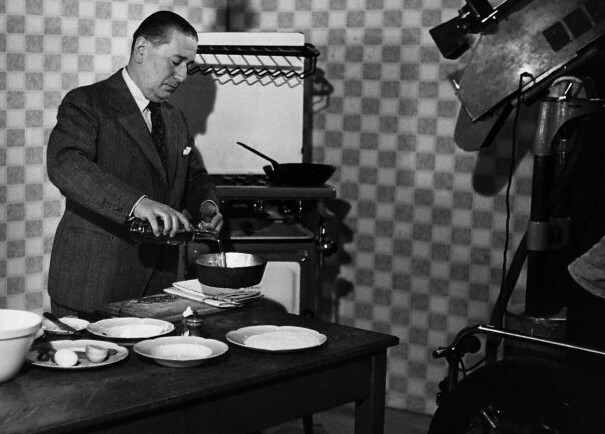 Way back in 1936, Arthur Elton directed an episode of an experimental BBC program “Cook’s Night Out”, entitled “A Scratch Meal with Marcel Boulestin”, which aired on January 21st, 1937, on the BBC network. It appears that the program appeared twice a month until 1939, when the BBC television service shut down because of the advent of WW II. Born in Poitiers, France in 1878, Chef Boulestin moved to London in 1906, where he had a varied series of careers: write and social commentator, interior designer, interpreter, and cook. His first cookbook, “Simple French Cooking for English Homes” was published in 1923 and apparently was a hit. Subsequently, he opened the Restaurant Francais in London, and later to new premises, which he called “Boulestin”, in Covent Garden. The restaurant continued under various managements until 1994, when it was supposedly replaced by a fast food restaurant. A new “Boulestin”, however, reopened in September, 2013, under the guidance of Joel Kissin, in a different location than the original Covent Garden location, to pay tribute to Marcel Boulestin. “Do not be afraid to talk about food. Food which is worth eating is worth discussing”. Marcel Boulestin died in 1943, probably without realizing he really was a trailblazer. I wonder what he would have thought about cooking shows on TV today. Perhaps astounded! This entry was posted in Cookbooks, Cooking, Cooking and Social History, Eating, Food Trends, Uncategorized and tagged Arthur Elton, BBC, Cook, Cook's Night Out, Cookbook, cookbooks, Cooking, food history, French Cooking, London, Marcel Boulestin, social history, time capsules. Bookmark the permalink. 1 Response to So, Who was Marcel Boulestin?